Being a businessperson is tough! Do you know what’s even tougher? Keeping all the business cards you collect, especially after a networking event or a conference. Thankfully, there are some business card scanner apps that can help you digitize all these cards. Before using business card scanner apps; I used to take a picture of the business card and set it as the picture for the contact. This seems like a nice idea at first, but when I’d like to make a call, I would have to manually type that number. Business card scanner apps, on the other hand, can automatically extract name and number for the card and save it as a contact. So, you are not just saving some space in your wallet. but, you also have the option to export it as CSV. But, there is one small problem, not all business cards are made the same. 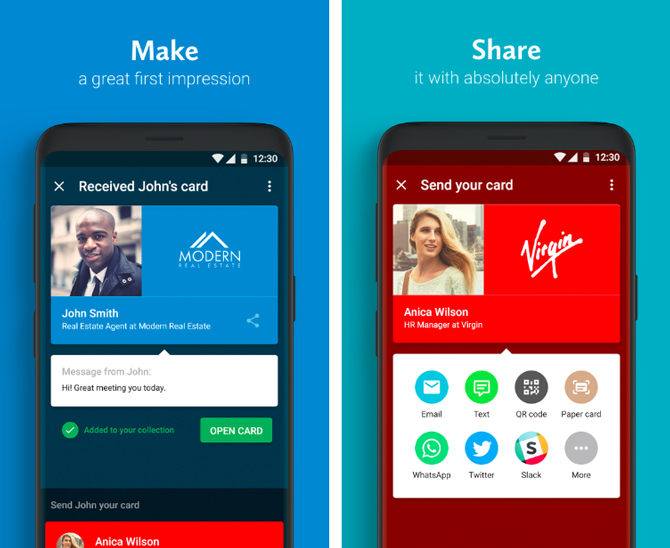 So, we tested some of the popular business card scanner apps for Android. After trying out 15+ apps dedicated for business card scanning, we have narrowed down the list to 5. So, you can count on these apps if you are tired of stuffing all those thick cards inside your small wallet. Haystack for Android is a great choice if you are looking for a quick way to digitize business cards. You can use this app to scan, store and access a variety of business cards. In addition to that, Haystack lets you create your own digital business cards and share them via NFC, Email, text, etc. If you often attend networking events, you can use Haystack to easily share your business identity with others. As far as business card scanning goes, Haystack offers basic features. It has an advanced camera interface, clubbed with inbuilt OCR. However, OCR isn’t perfect. You may have to make some edits even after the OCR scan is done. That having said, once scanned, Haystack arranges all the business cards — including digital ones — in an easy-to-use interface. If you need a simple app to take care of printed and digital cards alike, Haystack is a great option indeed. It offers a bunch of basic features such as OCR and Cloud Sync, though they aren’t perfect. The best part we find about Haystack is that it can seamlessly create, accept and share digital cards, which is the next big thing. Moreover, it’s ad-free. ScanBizCards Lite is another awesome business card scanner app for Android you can try. It does not have the most-modern UI or anything. However, when it comes to scanning and storing business cards, it is quite effective. More importantly, the OCR is almost perfect, even at lower light. Just scan the card and the app will include every bit of data from the card. Scanning any business card using ScanBizCards Lite is an easy task! Just click on the Capture button and boom — you have digitized the card. Of course, there are options for editing and organizing your cards. It offers an awesome feature named Email Capture, which captures email signatures and save them as contacts. You’d be able to connect your Microsoft, Exchange and Google email providers. You can count on ScanBizCards Lite if you need an ultra-simple app to scan business cards. While it does not offer many features, OCR and integrations are just awesome. Even with this simple UI, it packs a few advanced features like Email Capture and Export options. By the way, there is a feature-rich Pro version and paid Manual Transcription features you can check out. You would find WorldCard Mobile Lite as a great option if you need better OCR options. This simple app will be able to recognize 25 different languages, which is great. In the case of English, the recognition is quick as well as almost accurate. It also offers a better arrangement of scanned business cards, which is a great feature too. In addition to all the necessary features, there are some advanced ones too. 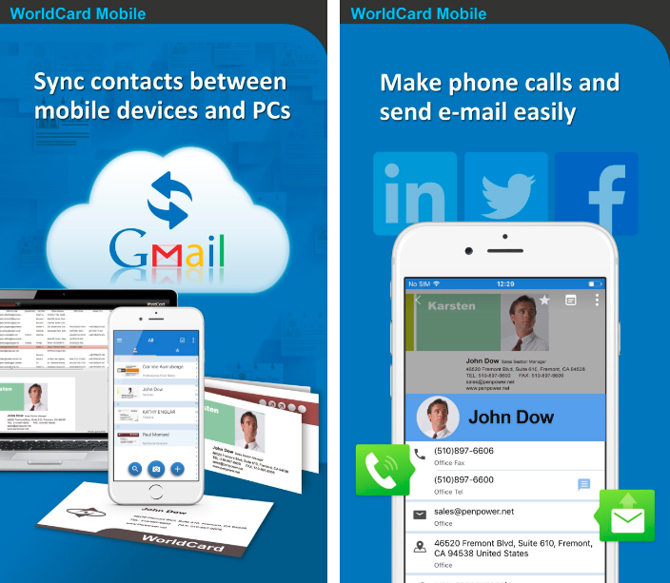 WorldCard Mobile Lite is also the Android business card scanner app that offers the best customizability. It even allows you to set reminders to contact newly-added people. Options such as auto-format and order of name display make the app even more impressive. More importantly, you can use WorldCard Mobile to get the backups stored in local storage as well as online services. If you need a customizable and feature-rich business card scanning app, WorldCard Mobile Lite is the best choice. You can alter almost everything in the app, making it suitable for every user. In addition, you get a more powerful OCR system and better organization options. That having said, we wish WorldCard Mobile Lite was allowing more contacts. CamCard for Android is one of the quickest and most effective ways to digitize business cards. In just seconds, the app will capture the card, arrange it and squeeze out information. Just hit the Save button and you can access the card data as if it’s a contact. For data sync and multi-device access, you can create an account at CamCard, free of cost. For most people, the free version should be enough as it can store up to 200 business cards. We were really impressed by the speed of the OCR engine. It’s supposed to work in 17 languages too. CamCard also lets you receive and share e-cards using QR codes and other modes. Thanks to the minimal UI, you won’t have any problem in accessing the data from stored cards. If you’re an entrepreneur or a small business owner, CamCard is the perfect choice for you. 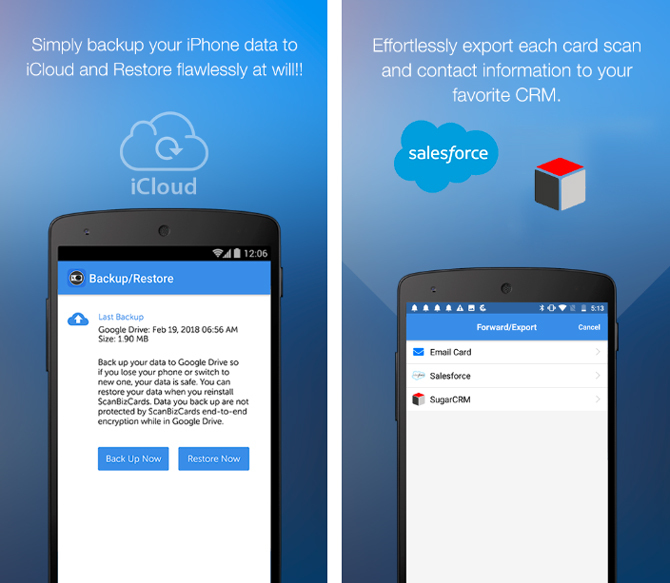 The free version lets you store up to 200 business cards in digital form. Not only that, using the app is really quick and accurate. Considering its support for digital cards and card sharing, CamCard becomes an optimal choice for future business conferences as well. 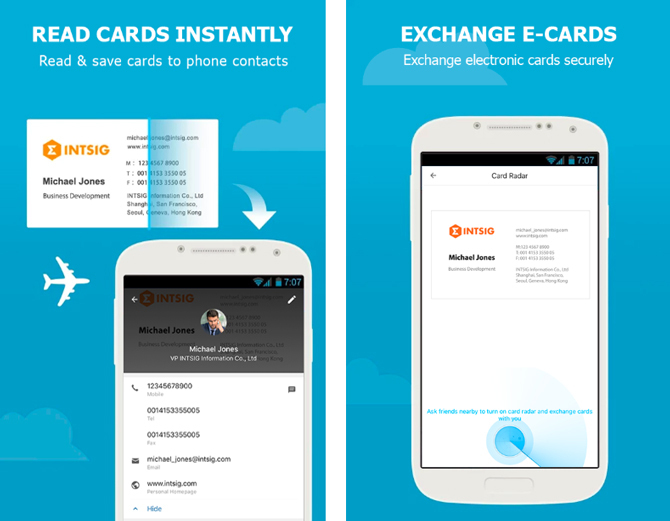 Wantedly People is probably the best business card scanner app for every Android user. It is noted for simple UI and powerful features. What we love about Wantedly People is that it can scan multiple business cards at once. You just have to place all the business cards side by side. The app will capture a big image, split the image into pieces and bring you details of each business card. It’s also one of the most innovative app here. This makes Wantedly People one of the best-suited apps for professionals. You can scan up to 10 cards once, which is great. In addition, it also packs a moderately quick OCR option. Apart from being a simple scanning app, Wantedly also lets you use the platform. While signing up, you can set up your profile. You can also add your own business card, as a part of your profile. I repeat Wantedly People is the perfect option for scanning business cards and storing them as contacts. Although it lacks advanced sharing and customization, every businessperson will love the app. It has a simple UI that lets you go through the contacts with an amazing easiness. Altogether, we will suggest this app for those who need clean scanning as well as a sharing platform. Here are some other apps you can use for digitizing your business cards collection. Some of these might not be dedicated business scanners, but they are good. Evernote: As you know, Evernote is a complete solution for storing things. The app can even detect what you are scanning. If you have the premium subscription of Evernote, you can easily scan, store and share business cards. The basic version, however, does not let you do that. It costs $5.99/Month though. FullContact: It’s not really an app dedicated to business scanning. It’s actually an address-book app that comes with business card scanning. That is, by scanning the business cards, you can keep all the data in your Contacts list. It’s a free app for Android that may come in handy for people who socialize a lot. It can even bring social media updates to one place. ABBYY Business Card Reader Free: You should consider this only if you are planning to upgrade to its paid version. As such as ABBYY BCR is really limited. You can’t even store more than 10 cards. That having said, if you can upgrade, ABBYY offers some cool features, such as compatibility with other apps from the same developers. So, if you need a multi-purpose app, you can consider the above-mentioned choices. We have included a diverse set of apps in both sections. For instance, if you need a quick & easy app for scanning cards, you can go for Wantedly People. On the other hand, if customization is your thing, apps like WorldCard Mobile Lite also becomes an option. Before you finalize, consider the number of cards you can store in the free version. By the way, do you think any other business card scanner app for Android deserves a space here? Do let us know via comments.